The wall-mounted whiteboard can be written on with whiteboard markers and can be wiped dry without residue. The matte board surface is projection-optimised and magnetic. The distance to the wall behind the whiteboard is 25 mm for the passage of existing cables. These are perfectly covered by the whiteboard. 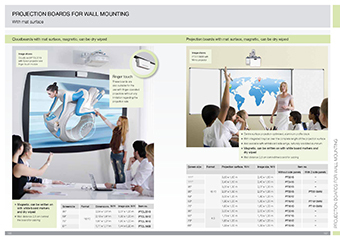 Our wall-mounted whiteboards in cloudboard format are a real eye-catcher and allow even with finger-operable projectors an unrestricted projection screen. Projection surface 2190 mm - 1470 mm 86.2" - 57.9"
Image size 1920 mm - 1200 mm 75.6" - 47.2"